Our whole flat is filled with apple flavour. In front of the kitchen there is a whole bucket of “Jakob Lebel” Windfall Apples waiting to be processed and in the living room I placed a big bowl with dark red “Pomme de Coeur” (Sternrenette). 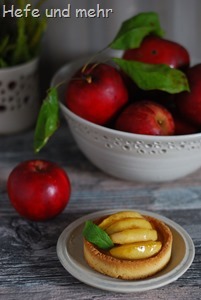 This is another old heritage apple variety and a joy for the taste buds and nose: flavourful, aromatic, delicious. And it’s dark red colour makes it a joy for our eyes as well. With so many apples in the house baking some apple cakes is a must. And as I got this beautiful tiny tartelett rings as birthday present using them was a must as well. I decided to go for a recipe from Matthias Ludwigs “Törtchen und Torten”. Some recipes are so time consuming that they were only made for big events. The Baumstriezel is one of these recipes, something my Transylvanian ancestors would have bake for weddings and christenings. And maybe for a 5th Blog birthday as well? A traditional Baumstriezel is baked over red hot coal wrapped around a big piece of wood, rotating the cake until the sugar starts to caramelize. Even nowadays it is made rather seldom and so I’m always exited when I could get a piece. So it seemed the perfect recipe to celebrate the fifth birthday of “Hefe und mehr”. But how to make such a cake without open fire in the kitchen (when setting the kitchen on fire was no opportunity)? I decided wrap the dough around a wooden rolling pin and to use the overhead grilling function of my oven for baking. That means that I had to stay in front of my oven all the time during baking. 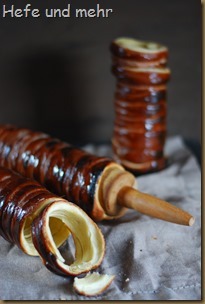 Every minute I turned the rolling pin a little bit until the sugar caramelized at all sides. It was quite time consuming but it worked out perfectly. 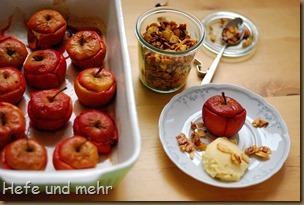 And so I could enjoy some sweet Baumstriezel to honour my Blog Birthday (with ongoing Blogevent). 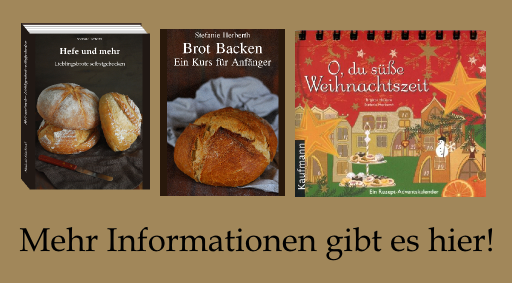 There is a big party going on in the Kochtopf. One big party? Not really, we are talking about weeks of parties! 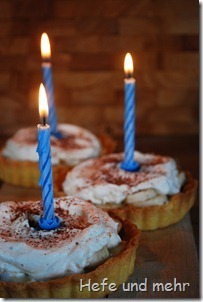 Dear Zorra is celebrating the ninth birthday of her blog. Can you imagine that she is already nine years blogging? And so the weeks are filled with events and surprises. For the monthly Blogevent she asked us to create recipes which use a hand blender or hand blender with or without accessories like a mini chopper. This time it is an easy task. 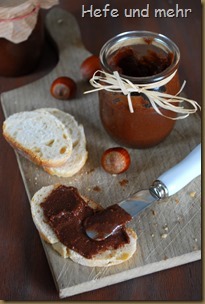 During our holidays in Alsace I bought a glass chocolate spread with nuts and crunchy caramel. It was a delicious treat, which I could eat with a spoon without bread. Being back at home I decided to make my own version of this spread. And already the first try was a success! The Spread taste of roasted hazelnuts and semi sweet chocolate, with finely crushed caramel, which slightly crackle when I eat it. A perfect treat for a birthday breakfast. To a birthday belongs a birthday cake. The traditional birthday cake in my family has to have a heart shape and will not be baked by the birthday child. And so my Mum will bake my birthday heart for me when we meet this weekend. But anyway I like to have a piece of cake on my birthday, too. And so I baked a small cake. Better to say, I bake three small cakes, one for each decade :-). I met the tempting combination of banana, caramel and cream as a cake at a birthday of a colleague and fell directly in love with it. I just modified the recipe a little bit, using my “Confiture de lait” recipe for the caramel, and cut down the amount of sugar in the cream and short crust. Even then, it is a really sweet cake, I can only eat a little piece at a time, but it tastes so good! Last Sunday we visit my sister in the new house. Because “it’s always good to have some pastry during renovation” (that’s what my sister told me early on the phone) I decided to bring something sweet. I was longing for something fluffy yeasted pastry. 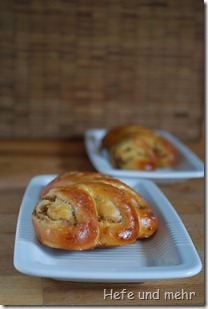 So I thought first of my favourite braid filled with nuts. But then I remembered that my parents would join us, too and my mum suffers of lactose and fructose intolerance. So the braid was out of question, we need something without milk and nuts. So I started to think: What happened when I just leave out the nuts? Then I would end up with dried breadcrumbs as filling. Hmmm. Bread crumb as filling sounded a little bit strange. But on the other hand we eat noodles with sugar and bread crumbs as children, and we liked it. So I give the idea a try and the filling worked out just fine. Its now about two weeks that I posted the last time. 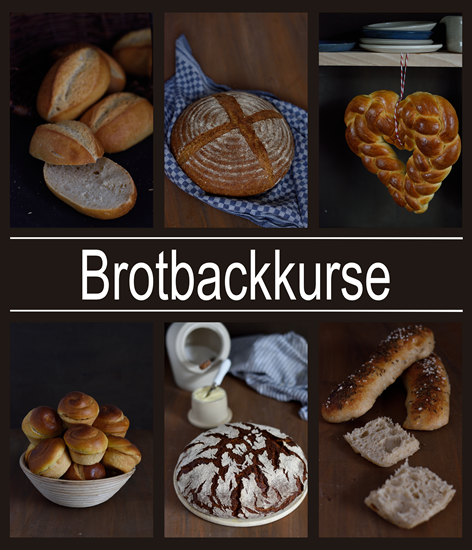 The last weeks were extremly busy so that I had no time for trying new recipes. I bake only recipe that are tried and tested. But if you are looking for something you can top on your bread I can strongly recommend Confiture de Lait. The inspiration for my recipe I found here, here und here . 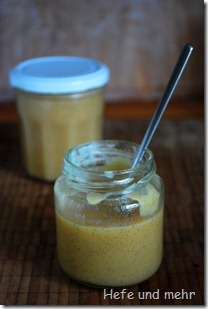 The confiture de lait is a caramel spread similar to dulce de leche. But while all recipes I found for dulce de leche asked for sweet canned evaporated milk confiture de lait is make with “real” milk. I do not like evaporated milk, so I preferred this recipe. And I love the fact that the confiture contains vanilla seeds and sea salt. That adds a delicious taste to the spread. And it is not a difficult to prepare. You need milk, sugar, a vanilla pod, some salt and time. I needed about one hour and I think that if you increase the amount of ingredients you have to increase the time for cooking, too. At the end of the cooking time you have to keep an eye on the confiture de lait because now it will become dark very quickly. I like it most when the spread is still light brown because then the caramel flavour is not so strong and harmonize very good with the vanilla.